Laws of war have been carefully defined by individual nations’ own codes of law as well as by supranational bodies. Yet the international scene has seen an increasing movement away from traditionally declared war toward multinational peacekeeping missions geared at containing local conflicts when perceived as potential threats to their respective regions’ political stability. While individual nations’ laws governing warfare presuppose national sovereignty, the multinational nature of peacekeeping scenarios can blur the lines of command structures, soldiers’ national loyalties, occupational jurisdiction, and raise profound questions as to which countries’ moral sense/governmental system is to be the one upheld. Historically increasingly complex international relations have driven increasingly detailed internationally drafted guidelines for countries’ interactions while at war, yet there are operational, legislative, and moral issues arising in multinational peacekeeping situations which these laws do not address at all. The author analyzes three unique peacekeeping operations in light of these legislative voids and suggests systematic points to consider to the end of protecting the peacekeepers, the national interests of the countries involved, operational matters, and clearly delineating both the objective and logical boundaries of a given multinational peacekeeping mission. Mays, Antje. 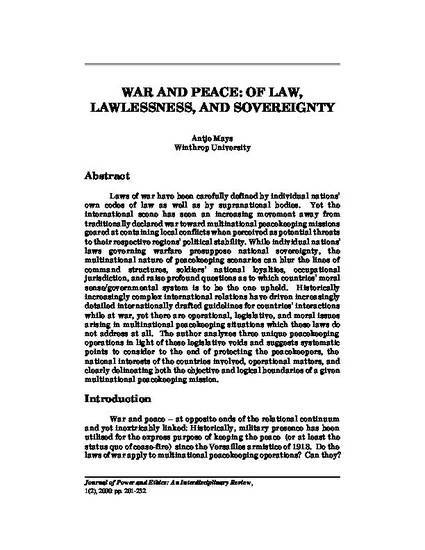 “Of Law, Lawlessness, and Sovereignty : Multinational Peacekeeping and International Law”. Journal of Power and Ethics: An Interdisciplinary Review. vol.1:no.2, April 2000, pp.201-232.